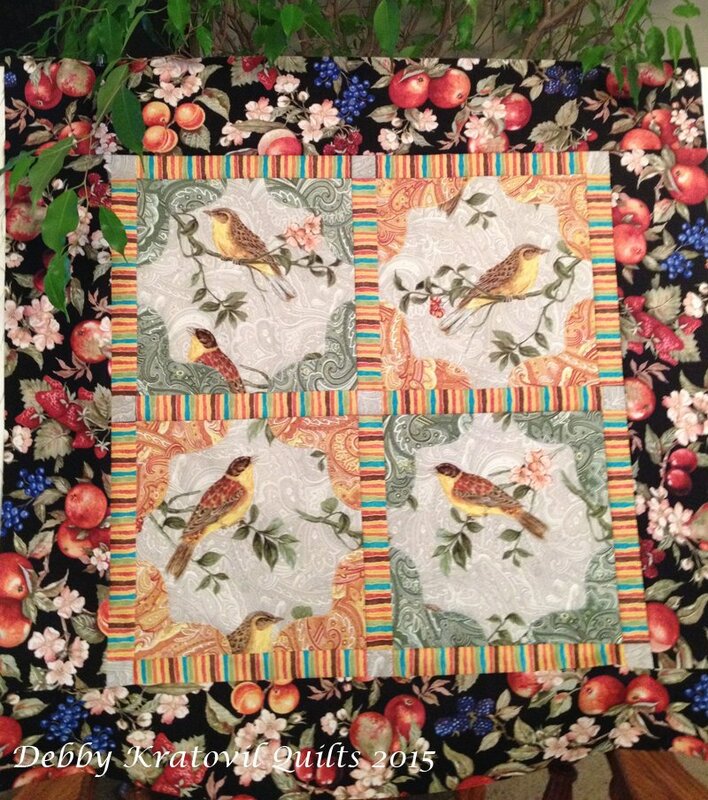 I live in Virginia and I am excited to be teaching at the Mid-Appalachian Quilters retreat July 13-15 in Emmitsburg, MD. 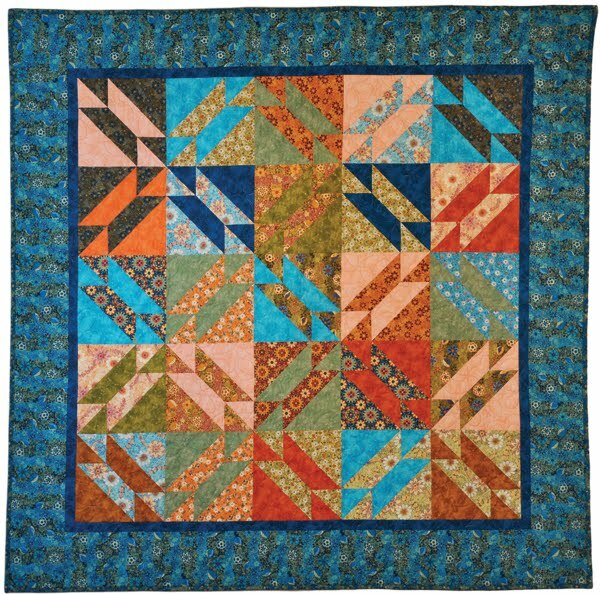 Every year they raffle a quilt with the proceeds going toward a worthwhile charity. 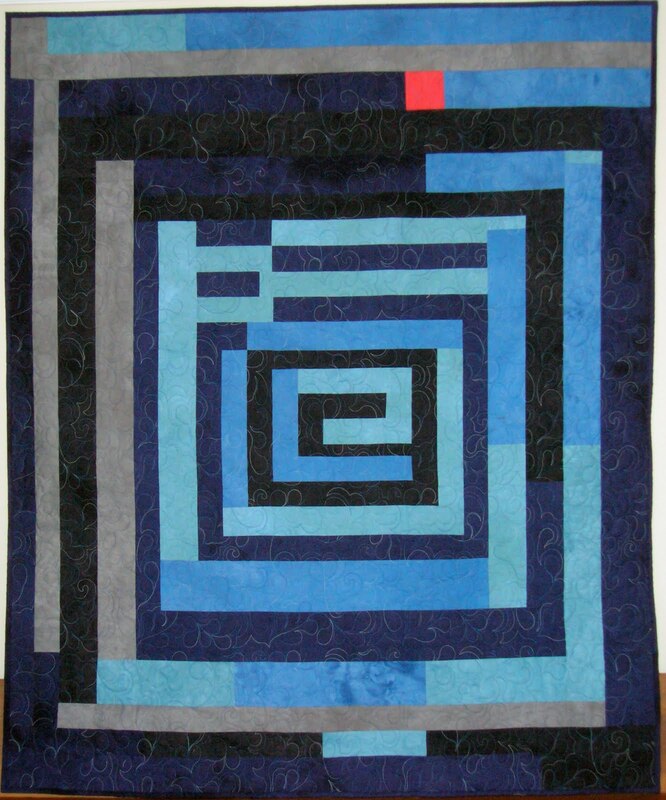 I donated this year's quilt, one I designed and made for Blank Quilting a few years ago. 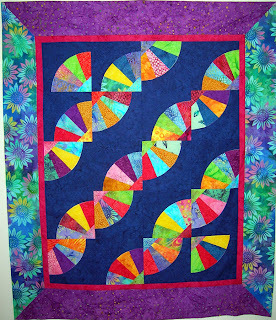 The quilt kept crying in the closet, asking for someone to love it, and I figured this is a way to make both the quilt and winner happy - along with providing funds for Ovarian Cancer Research. Here is the quilt (you can buy tickets from MAQ) and also the free two page pattern. 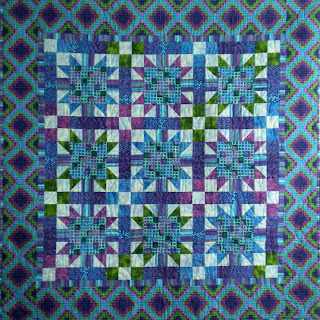 It is an easy block and quilt and I hope you enjoy it! 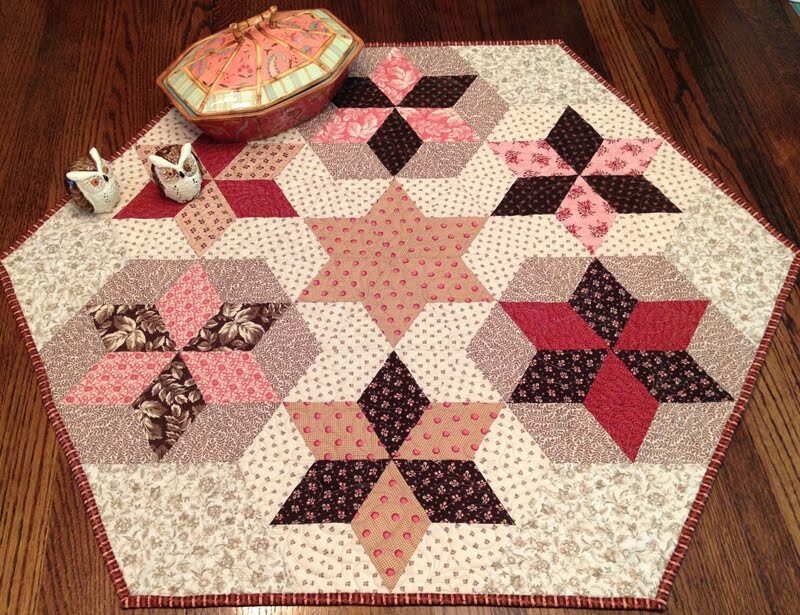 I named the pattern Color Blox Stars; the traditional block is called "Souvenir" and it is 15" square. 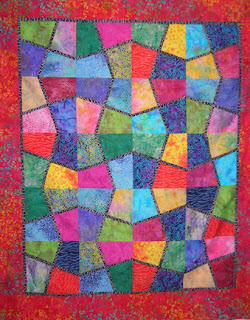 Souvenir Stars - 65" x 65"
I'm here in the beautiful city of Rochester, Minnesota for the annual quilt show for Minnesota Quilters. They put on a fantastic show in one of the most important cities in the USA. Why is it important? It's the home of the famous Mayo Clinic, a place we ALL respect and hope we never have to visit, but are glad it's there if there is ever a need! I thought I would post pictures of the 3 classes I am teaching (OK: 2 are past, one is coming). I have had motivated and very happy students so far (yes, I get a grouch every now and then). 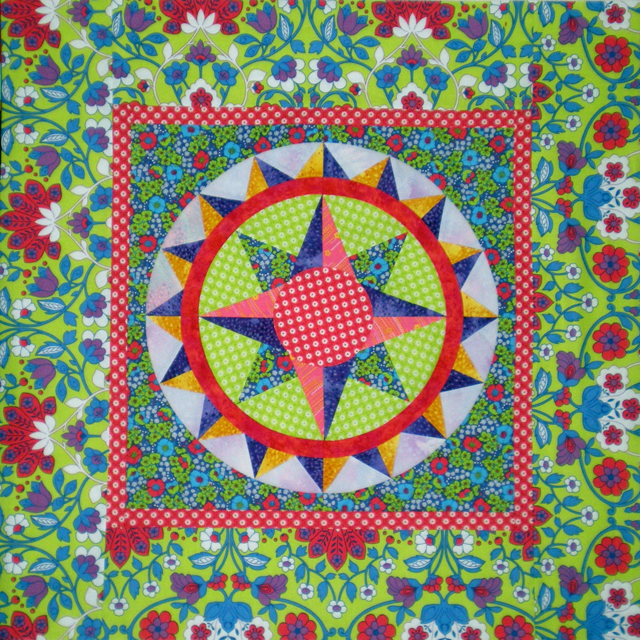 The first class was on Wednesday - the Sassy Mariner's Compass! 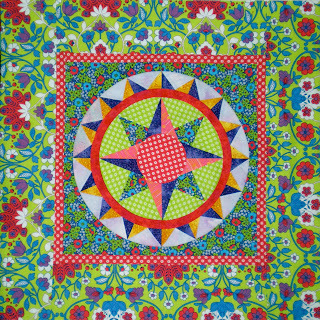 This began with the center compass which is the basis for my Beginner's Mariner's Compass class. 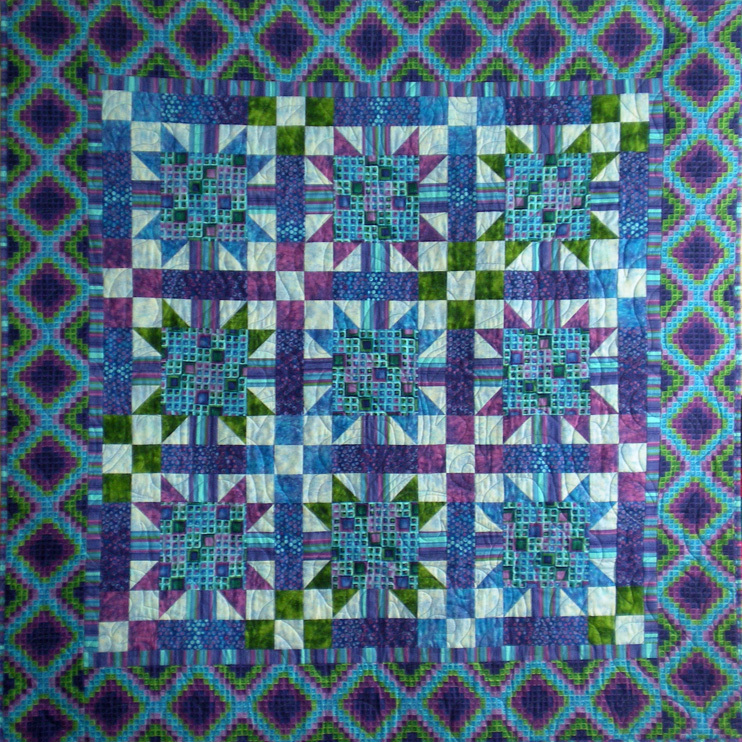 An easy 16" block with curves gentle enough for a novice quilter. Then the halo of points were supposed to connect to the center, but I didn't measure correctly and after I pieced all of them I discovered a 1" gap! Yikes!!! So, I had to add the red donut ring and voila! they all fit together. There is a lot of piecing, but because it's done on paper foundations, the points stay as points and my students were happy as clams to discover they had a compass they could actually finish. I didn't have a full class of 20 students, so I have extra kits available with ALL the foundations, freezer paper, templates, etc for those who would like to try their hand with this. Just send an email and I'll give you more info. This quilt is part of my Magic Stax© series. Working only with 10-1/2" squares and a piece of freezer paper, we draw our pattern and then use it to cut out a stack of fabric squares. 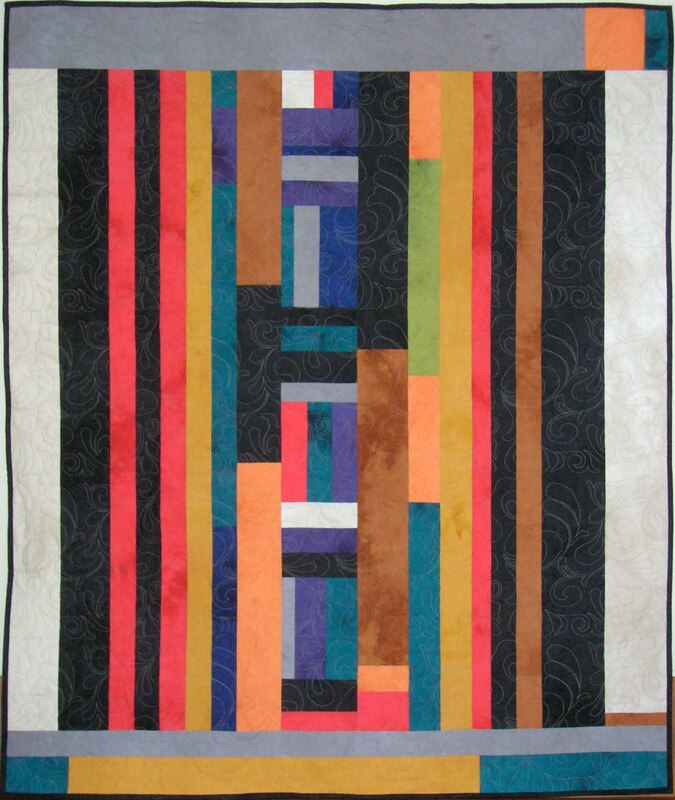 Insert the thin dark strips and when all the blocks are placed together, they can resemble stained glass. 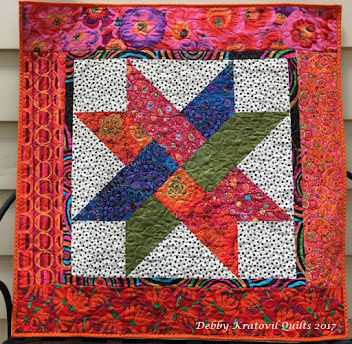 This is one my most popular workshops and patterns. The class was a full house and I had such fun with motivated - and highly skilled - students! Yes, we really paper piece on coffee filters. They are just convenient circles!